If you don't already have a login at Betty Crocker, you can go here and sign up and receive a coupon for free YoPlus Yogurt. I really like this yogurt. I like that there is both a regular and a sugar free option. 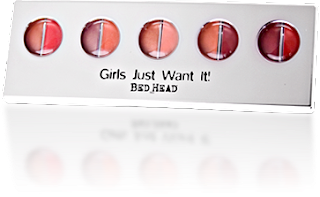 Tigi Girls Just Want It Lip Pallet - this page is really slow to load at times (update: I couldn't complete it last night, I had to wait until the morning and then it took me only a couple of minutes to complete). The value is $25, the price right now is free and the shipping is free, so they don't even ask for credit card information. You do need to create an account and the offer is limit of one per customer.